Worldwide, the number of bee species is estimated at around 20,000. Approximately 700 species are living in Europe.The bees with a defensive sting belong to the species aculeates. The vast majority of all bee species are solitary bees, which make no insect colonies. They live alone and only adopt brood care for their own offspring. Solitary bees place the egg together with a food storage and the storage is firmly closed. 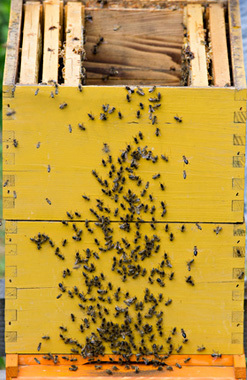 High social community forms, particularly colonies like the honey bee’s ones, is the exception among the bee species. Such communities focus almost exclusively on the family of the Apinae, namely on Apis with 9 species, Bombinae with 200 species and Meliponinae with around 300 species. Since all the bees significantly contribute to the conservation of wild and cultivated plants and their yields, their ecological importance is significant. Bees are the most important pollinators worldwide. Their economic importance becomes also clear when you look at the example of Germany, where currently over 80,000 beekeepers keep approximately one million bee colonies. These cover with about 25,000 tons about 20% of domestic honey need per year. Bees are vegetarian. Sweet juices of plants, nectar in particular, are their main food source. The bees depend on pollen for the protein supply. Species of colony-building classes and families, such as bumble bees, meliponini and especially honey bees stockpile food.